1) On a business card you need your contact details of course. Develop a nice font for this, maybe even an icon for a phone or email. Think about the style of your text matching the style of your portrait and pictographs. How do you want to present yourself? However, you do not need to add your specifics in this assignment, as you need to upload it later. Just develop it for yourself. 2) Next step is to structure your card. 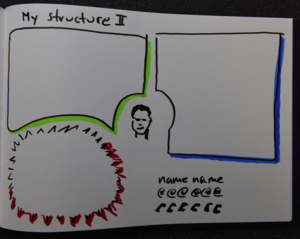 You have the drawings and visualisations developed now, but the question still remains of how you want to present them on your card. 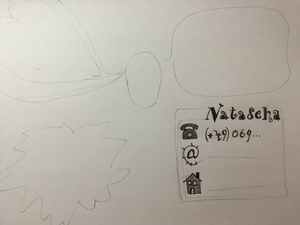 So take your sketchbook and look at the format of a business card. Think about how you want to structure the space and where you want to place every single item. Play around until you've found your perfect set-up and place the content accordingly. 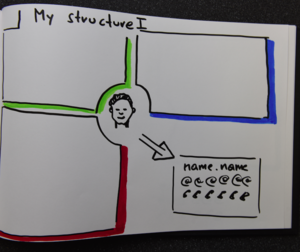 Remember: containers and connectors are a great way of structuring your content. "Having the individual content components in place I started experimenting with the overall design. I decided that I wanted the portrait/face in the middle and the other parts grouped around. However, you should decide for yourself, which structure and design is the best for you! Please do not stick to my order. I then did a couple of designs and invested quite some time in exploring what kind of colour to use and what kind of containers. Too much colour would mess things up, and too many borders and containers would probably also not look too good. I also struggled a little bit on how much room to provide with “the things I do not like” as I did not want them to be too prominent on my card. However, I also did not want to exclude them, as they are also an important part of information about myself. 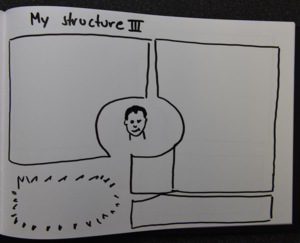 Here are some versions I did to find out the right structure."